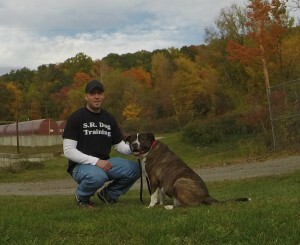 Dixie’s family contact me for Dog Training in North Salem NY. She is a Black Russian Terrier, which means she is going to be a big girl. It is important that every dog be well-behaved and obedient, but this is even more important with large breed dogs. Dixie exemplifies all the positive qualities you could want in a puppy…she is cute, intelligent, happy, and loves everyone! Her family are one of the most dedicated, conscientious & loving owners I have ever seen! Most dogs love going for a ride in the car, however there are many that struggle with the car riding experience. Some dogs refuse to get in or out of the car and find the ride to be nerve racking and unpleasant. Needless to say, this is stressful and difficult for both dog and owner. 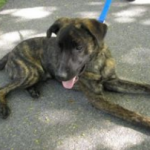 This is why Luki contacted me for help with dog training in North Salem NY. She had been struggling for years to get her two dogs in and out of the car. In just one training session, we were able to successfully get both her dogs to jump in and out of the car with no issues. Regardless if you are looking for obedience training and dog training in North Salem NY, make sure to use simple and safe dog training principles, that are easy for you to use and your dog to understand. 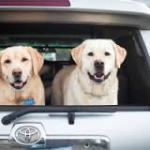 “I had been lifting my 2 dogs into my car since I got them, because they were hesitant about getting into car. After 4 years of this bad behavior (on my part), I just couldn’t do it anymore; one of the dogs had turned into a 100 pounder and they wouldn’t listen to me when I asked them to get into the car on their own, as I had created a monster. I had used one trainer in the past to help me with obedience training on 4 prior dogs, but she didn’t really seem to enjoy what she was doing so I didn’t want to call her again. When I started working with Dewey, he was very high energy, would not go to the bathroom anywhere except his yard (made it impossible for his owners to take him to parks, other people’s homes, etc. ), nervous around new people/situations, and was a very strong puller (which made walks extremely uncomfortable and difficult for his owners). A lack of appropriate/constructive outlets for a puppy’s high energy level will result in undesirable behaviors such as excessive barking, mouthing/chewing, destroying the home, hole digging, etc. We have many bike paths and parks in our area which makes puppy training and dog training in North Salem NY very “owner friendly”. A structured walk that is comfortable for both dog and owner is a great way to eliminate pent up energy. We transformed Dewey from a leash puller into a politely walking dog in one training session. Proper positive socialization is essential to successful puppy training. Dewey had a natural tendency to be fearful, anxious, and nervous, so positive socialization was critical for him. We want all socialization/ interactions (with people, dogs, cats, bike, cars, etc.) to be positive and happy experiences. A negative experience with one of these stimuli at an early age can lead to issues later on.